You may recall that last week I was feeling pretty wiped out during my first leg day after the long road trip. 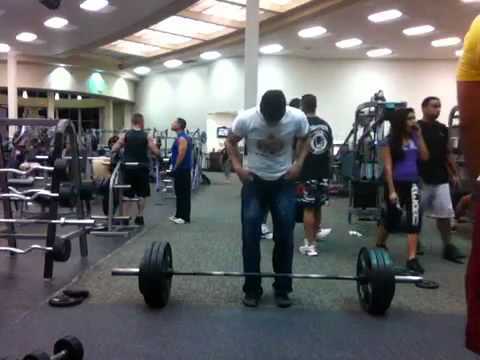 I felt fatigued and weak, capping out with a one rep of 335 pounds in the dead lift. Well this week I am feeling better. In fact I felt well enough to take down one of my shorter term deadlift goals, one rep at bodyweight x 2, as I pulled 365 pounds off the floor. I felt solid up until that point with both my squat and deadlift sets so I figured I may as well give 365 a shot even though 335 felt pretty damn tough. I knew the strain lifting this much weight was going to be extreme. I even scouted out the amount of open floor space in front of me, making sure that if I passed out I would have a clear landing area. Unlike 335 which feels very uncomfortable going up but not bad once I get up to the lock out position, 365 felt miserable the entire way. There was no prolonged pause at the top position, as even with my reverse grip in place, I could feel gravity starting to open up my hands. I plunked the weight back down on the floor with a satisfying clang. In the brief time period I had the weight in the air I got to walk in the shoes of a 540 pound man. Let me tell you, it isn’t a pair of shoes I could move in for very long, wow. My next DL goal would be to hit the 400 pound mark but that feels like it would be an awful long distance away. I think I would have to go to lifting straps to even think about it.